Iris van Herpen (pronounce Ear-riss) is one of the few fashion designers today whose work has the intellectual sustenance to be exhibited in the context of an art museum. Also in this rarified category of forward-thinking, boundary pushing, rule-breaking avant-garde designers is Rei Kawakubo, whose work is currently the subject of the Met’s Costume Institute show entitled Rei Kawakubo/Comme des Garcons Art of the In-Between, Alexander McQueen, Victor & Rolf, Martin Margiela, Gareth Pugh, Vivian Westwood, Yohji Yamamoto and John Galliano. There are others who work at the intersection of art and fashion, but you get my drift. The 33 year-old, soft-spoken Dutch designer studied fashion design at ArtEZ Institute of the Arts Arnhem and later landed an internship at Alexander McQueen. By 2007 she had her own label and in 2011 became a member of the prestigious Parisian Chambre Syndicale de la Haute Couture. Iris, a former dancer who cuts a tall, willowy figure, appears – in contrast to her lavishly embellished oeuvre - to personally favor a minimalist style. And, for what it’s worth, my 20 year-old son thinks she’s hot. Many fashion designers work to make women look good, Iris and her avant-garde contemporaries work to make people take another look. Iris’ dresses, skirts and tops are wild, fantastical, gorgeous and extreme and are united by the use of state-of-the-art technology and their simple, bodycon silhouettes – the most basic components of the fashion ecosystem. The work gives the impression of being futuristic, however, Iris states that they are not; they are very much of the moment as she uses technology that is readily available. In addition, they are first and foremost clothes that are made to be worn and have been by celebrities such as Bork, Katy Perry and Tilda Swinton. Iris’ work contains all of the principles and elements of fine art including the interpretation of heady, high concepts such as the effect of electricity on the body, the transformative experience of skydiving and the ambiguity and elusiveness of factory smoke. Iris’ multi-disciplinary approach and collaborations with artists, architects and scientists takes her work way beyond traditional fashion. However, the body is her muse and movement is the key. Iris believes that while her work is sculptural, it is not sculpture because each design is only fully realized when it is being worn. This, then, begs the age-old question: Can fashion be art? Karl Lagerfeld, Miuccia Prada and Rei Kawakubo all deny that fashion is art. As beautiful, evocative, thought provoking and conceptual as fashion can be, it is a creative industry; it is part of our daily lives and therefore has a practical purpose, which art does not. Historically, however, definitions of art have changed. In the past only Old Masters paintings and classical music were considered to be legitimate works of art. Later, in 1917, Marcel Duchamp submitted a urinal as a piece of sculpture entitled “Fountain” to the Society of Independent Artists exhibition. The piece was to be turned 90 degrees – thus rendering it functionally useless. It was rejected, but he made the point that the artist is the selector and went on to designate other ordinary, “Readymade” objects as art. Andy Warhol began his career as a commercial artist. After some attempts at transitioning to fine art, in 1962 he made a series of Campbell’s soup cans that resembled printed advertisements but were hand painted. He exhibited them all together on shelves like a grocery store display. In some sense, Iris’ thought process reminds me a little of the Lucas Samaras chair transformations. His intention in the series of 25 pieces was to de-familiarize the chairs by the use of a perverse and witty assortment of materials that take the objects out of their traditional context. Thus, unlike Iris’ dresses, most of the chairs cannot be used for their intended purpose. Since what is considered to be art has evolved dramatically over the years, maybe fashion is being legitimized. Fashion exhibitions in art museums have certainly blurred the line. The fact remains, however, unlike art criticism, fashion has not been subjected to the same high-level critical interpretations. The French philosopher Pierre Bourdiew said, “The work of art is an object which exists only by virtue of the (collective) belief which knows and acknowledges it as a work of art.” After all is said and done, I don’t care whether or not fashion is art. The Scottish soccer player and manger Bill Shankley felt about football (soccer) the same way I feel about fashion: “Some say football is a matter of life and death – I’d say it’s much more important than that”. 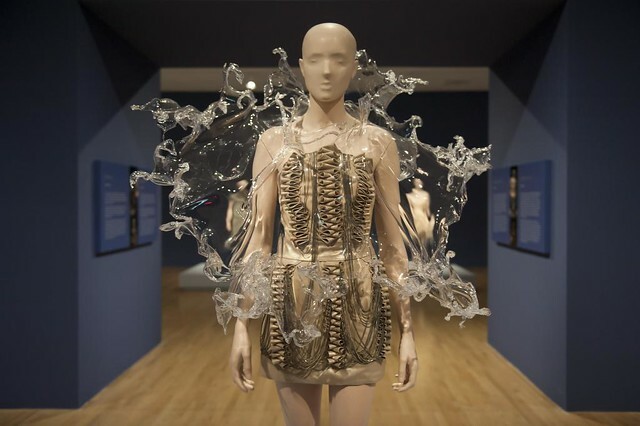 Iris van Herpen: Transforming Fashion is available for viewing at the Dallas Museum of Art now through August 20, 2017. This exhibit will require a $16.00 special exhibition ticket with discounts for seniors, students, and military. DMA Members and children 11 and under are free.